Ambassador Manuel Escudero took up his duties as Permanent Representative of Spain to the OECD on 12 July 2018. Mr. Escudero was born in San Sebastián. He is an economist and holds a degree in Business Studies (Deusto, Spain), a Master's in Regional Economics (MSc), 1977, and a Doctorate (PhD), 1987, both from the London School of Economics. From 2005 and 2010, Mr. Escudero was Director of Networks of the UN Global Compact Initiative, whose purpose is to bring together responsible companies in public‐private partnerships with other civil society institutions. Mr. Escudero fonded in 2007 the Principles for Responsible Management Education (PRME), an international initiative supported by the United Nations, in which more than 700 business and business administration schools participate in 85 countries. 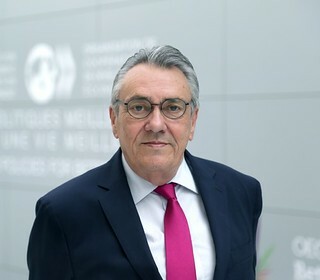 Prior to taking up his duties as Ambassador and Permanent Representative of Spain to the OECD in 2018, Mr. Escudero was Secretary of Economic Policy and Employment at the Executive Commission of the PSOE, and Special Adviser to the Office of the United Nations Global Compact Initiative, in New York. Manuel Escudero also has a long-standing career in the academic sphere. He was Professor of Macroeconomics, Dean of Research and Dean of Cloister at the Instituto de Empresa, IE Business School in Madrid, between 1991 and 2005. In 2010, Mr. Escudero returned to Spain as General Director of Deusto Business School (2010‐2014). Mr. Escudero has combined this international, professional and academic activity with public and political activity in various periods of his life. He has written 5 books and has participated in more than 10 collective volumes and published more than 150 opinion articles.